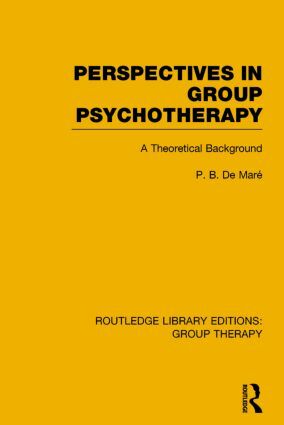 This book, originally published in 1972, aimed to provide a theoretical framework for group therapists to guide them through the mass of variables which beset them. Its scope therefore is extremely broad, for it also touches on philosophy, psychology, sociology, communication and general systems theory. In the last chapter certain conclusions are drawn concerning the relationship between group and psycho-dynamics. The book will be of interest to those who have already had some experience of small, medium or large groups, and who want to think about their work in more general terms: it was not at the time widely realised how radically different and how potentially powerful are the implications of group procedures, not only for therapy but in such fields as education, industry and politics. Freud recognised this when he pointed out the dilemma of having to procure for the group precisely those features which were characteristic of the individual, and which are extinguished in him by the formation of the group. Whilst the problem for the individual is the intrusion of unconscious factors, for the group it is the group’s equivalent of consciousness, namely communication and organization, which is in a quandary. The group model differs crucially from the psychological, but they may relate in the sense that, as Freud indicated, neurosis represents a recapitulation within the individual of mankind’s group history. The unconscious mind, then, is a group phenomenon. In other words, group theory turns psychoanalysis upside down and begins at the point where Freud left off, relating neurosis to its social sources. In the light of the group approach, therefore, neurosis and certain of the psychoses can be viewed as localized deposits of unresolved group experiences within the individual, whether they be past, current or an expectation of the future; a feature which makes traumatic neuroses more understandable since they cannot be explained in terms of infantile neurosis. The author suggested the possibility of a new development in group techniques, namely that of large group therapy freed of community ties or training considerations, in which attitudes and ideologies make themselves evident, not as cloudy idealistic non sequiturs but as crucial and clearly definable climates which either impede or promote communication and the flow of information.